New King James Version Gift and Award Bible in Purple Imitation Leather. 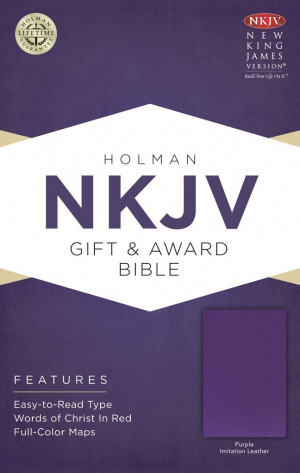 NKJV Gift and Award Bible Purple Imitation Leather by Holman was published by B & H PUBLISHING GROUP in March 2013 and is our 656th best seller. The ISBN for NKJV Gift and Award Bible Purple Imitation Leather is 9781433604645. I ordered this Bible so that people who are new to church would have a Bible to,take away. It’s a good price for a priceless possession. Got a question? No problem! Just click here to ask us about NKJV Gift and Award Bible Purple Imitation Leather.